A TV telethon is the "gimmick" in Allied Artists' The Big Tipoff. 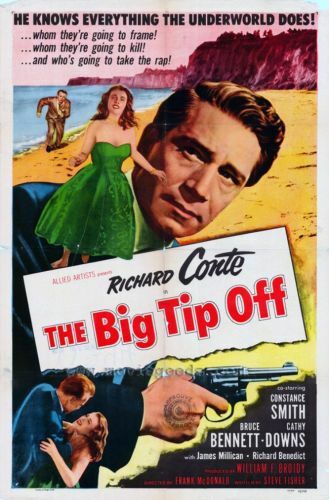 Richard Conte plays two-bit newspaper columnist Johnny Denton, who gains notoreity by printing tips on upcoming gangland activities. Denton heightens his fame by refusing to reveal the source of his information; the audience knows, however, that Denton's tip-off man is crime kingpin Bob Gilmore (Bruce Bennett), who is in the process of staging a phony telethon to scam the public. This plot element is mainly an excuse to offer a series of unrelated variety acts featuring such LA TV personalities as Spade Cooley, April Stevens, Chuy Reyes, and Ginny Jackson. The two male protagonists are given a chance for redemption through the auspices of Sister Joan (Cathy Downs), but an apparent murder muddies the proceedings.